The annual TEFAF art market report has been scrapped in favour of a number of smaller, focused reports, leaving Clare McAndrew’s Art Basel report as the sole market-wide survey. According to a report in the Financial Times today, TEFAF said its next report will be penned by Anders Petterson, founder of ArtTactic. It is expected to cover art finance and will be released in May to coincide with TEFAF New York Spring. McAndrew, who had penned the TEFAF report since 2008, left in 2016 to compose a similar report for Art Basel. TEFAF then hired Maastricht University professor Rachel Pownall to produce its report that was published in March last year. Pownall’s report’s methodology differed from McAndrew’s, revealing contrasting results: Pownall revised the art market’s 2015 value to $44bn from McAndrew’s $63.8bn. For 2016 it estimated the total was $45bn, while McAndrew had it at $56.6bn. 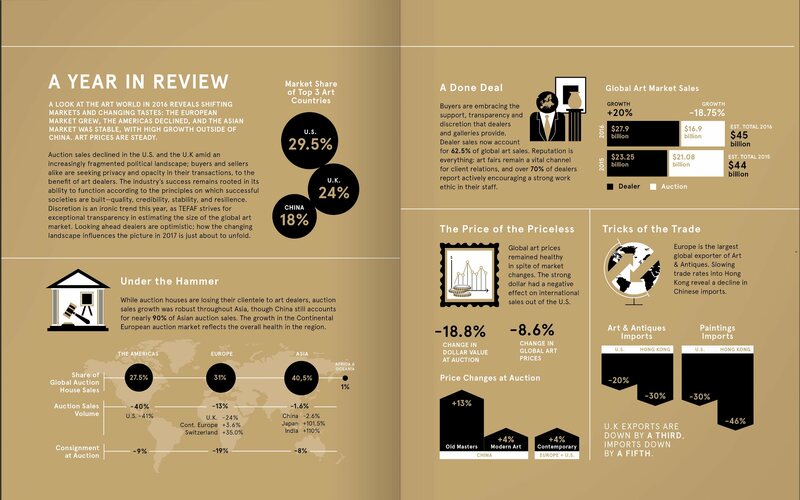 Pownall published two reports for TEFAF – the main art market report in March 2017 and an online report in June 2017. Pownall, with colleagues at the Business School (UMIO) at Maastricht University, is preparing a new 2018 art market report with a new partner to be announced and released later this year. McAndrew is compiling her next report which is due to be published in early March. ← Exposition d’Avant-garde russe à Gand : vraies ou fausses ?